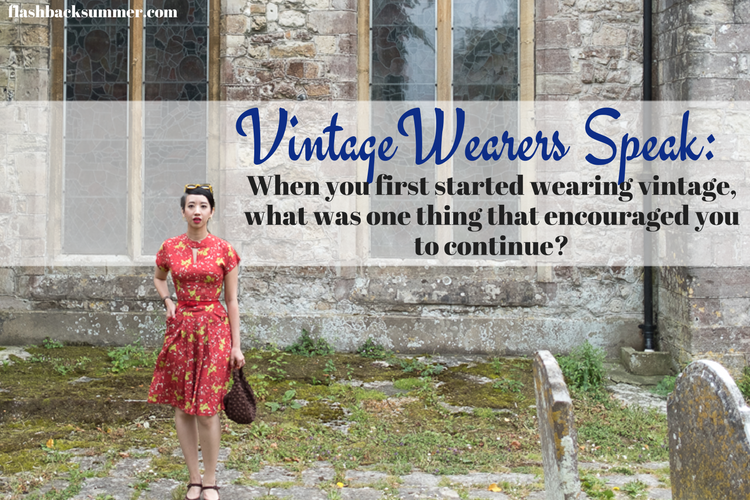 Vintage Wearers Speak: When you first started wearing vintage, what was one thing that encouraged you to continue? This post is part of the "Vintage Wearers Speak" series. Read more about the series and find the other posts here. Q: When you first started wearing vintage, what was one thing that encouraged you to continue? The online blogging community and the fun of wearing vintage are what kept me going. I never saw anyone wearing vintage in real life, so blogs were the way I saw how vintage style was put together by others, that others even wore this old stuff! I also really enjoyed the creativity of finding old pieces and having one of a kind outfits. The fact that what I wear is one-of-a-kind and stand out from the fast fashion crowd! I started to wear true vintage clothes when I was a little girl without noticed it! My grandma took care of me when I was young and she dressed me with my mom clothes from the 60s. My bedroom was my mother's bedroom as the same age with all her clothes, books, toys even furniture or ballet shoes. Without knew it, I was living a total vintage lifestyle; wearing 60s clothes, playing with vintage dolls and listening her French records. I grew up and was a teenager dreaming about Audrey Hepburn style and started to dress like her with modern clothes. Step by step, I started to buy vintage clothes and built my vintage wardrobe. I would have to say that it’s my husband who encourages me to continue my passion of vintage clothing and lifestyle. He says when he sees me wearing vintage (mostly vintage reproduction) that I have the glow and my confidence comes out. I would have to agree with him on that; when I wear the vintage clothing I feel good, I feel stronger and I feel more like myself in it. I started wearing vintage about 5 years ago, and at the time, I personally didn't know anyone who dressed like that. I had always loved "old stuff", but didn't realize that I could wear it myself day-to-day (not just as a costume), until I stumbled upon the online vintage community. Knowing that there was a vintage community around the world, gave me the courage to start dressing that way too. I knew that even if I never saw anyone wearing vintage in real life, there are others out there who share my love for vintage fashion! Reminding myself that this is what makes me happy and feel beautiful each morning I dressed that way. It was my sophomore year of college and I was gradually cocooning out of that awkward teenager who struggled with severe anxiety. Dressing vintage helped me blossom into who I wanted to be and it helped me feel confident with my body shape. It felt great not conforming to the average college girl look - not because there's anything wrong with wearing leggings and hoodies and whatnot, but because I never liked wearing them for myself. When I began discovering my own style niche, I became less anxious and more open to who I am. It helped me to not hide behind that veil of blending of and constantly worrying about impressing others and instead focusing more on impressing myself. 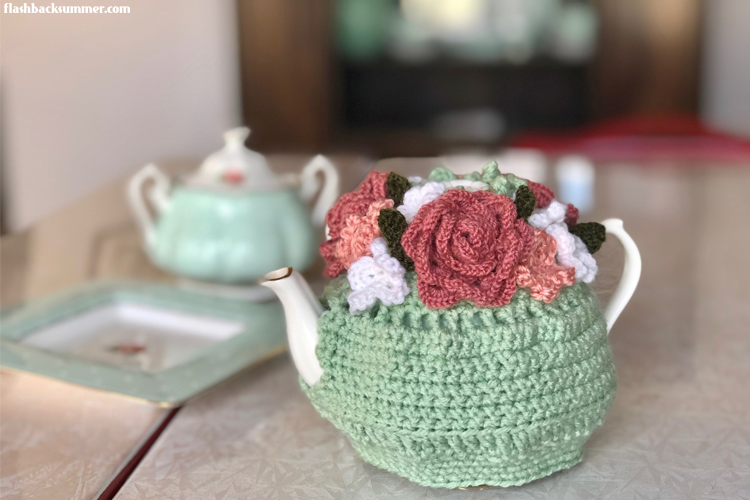 I didn’t have any trouble when I first started; I had always been so attracted to antiques and the past and I was having so much fun exploring vintage clothing. It was actually more difficult a few years in when I began to get a little burned out. Social media, specifically Instagram, really helped me to appreciate that there is no “right way” to wear vintage. So many people have their own flair and their own style, so that encouraged me and helped me to modify my style into a mix of old and new, and not to feel tied down to strictly period accurate attire all the time. I dabbled with dressing vintage on my own for years, but what really got me hooked was finding other like-minded people who loved historical clothing. It went from sort of a secret hobby to one that I embraced more openly, because I found others who also enjoyed it instead of thinking I was odd for liking to "play dress up" or enjoying history. It really was those internet friendships that helped me connect with people in real life who got it. I pretty much only wear vintage for events. My brother was really what encouraged me to continue since he got me excited about the WWII era and participating with him in events since he would dress up as a soldier. Now I feel like I can step out on my own and go to events without him and still dress up. When I first discovered vintage, it took me a couple months to figure out what fit my body best. But once I did, I noticed that with a great fit came ease of movement, confidence and a foundation for creative expression--all things that had been lacking for me when I tried to wear modern clothes. It was the way they made me feel like myself, like a new self that I had just uncovered, that encouraged me to keep going. What about you? What encouraged you in YOUR vintage wearing when you first started? When I first started wearing vintage, I loved being able to pick a silhouette that looked good on my body rather than trying to mold my body into whatever everyone else thought was stylish at the moment. It gave me such confidence about my body. I also loved the creative outlet of sewing my own clothes. Everything always fit and I could have exactly the pieces I wanted. YES! That is all so true! So freeing to realize clothes are supposed to fit your body, not the other way around. I always loved fancy dress as a kid, especially all the 1930s and 1940s styles and this continued into my teen and twen years with Gothic style. However, I always felt I was wearing fancy dress, Gothic was too dramatic and too medieval for my taste, so I tried to stick to an all black palette, in modern clothes. In my late 20s I started re-enactment and while I did different eras, I felt so comfortable in certain eras that wearing the clothes (either true vintage or repros) in my normal life outside of events was a gradual transition. I'm now 50 and I returned to my roots. 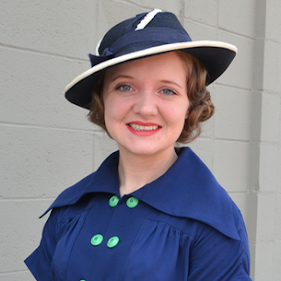 I wear vintage as well as a lot of reproduction dresses from the 1930s and 1940s. I mix stuff, as I am plus size and you do not get many real vintage in my size. So I mostly sew for myself from authentic patterns and buy modern thrift store stuff that can easily be altered to a more vintage look. That is awesome! So fun to hear how your style has evolved throughout the years. 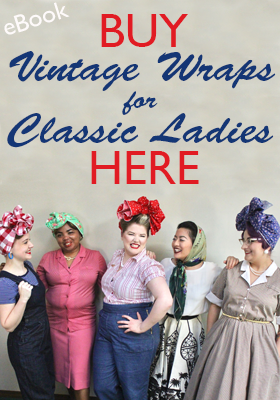 And way to go on making vintage work for you!